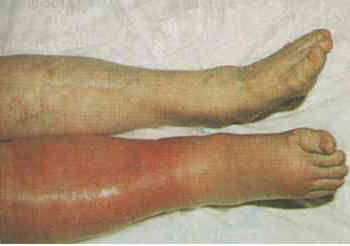 Deep vein thrombosis usually abbreviated as DVT is the formation of a blood clot (thrombus) in a deep vein. Deep vein thrombosis commonly affects the leg veins or the deep veins of the pelvis. They also can occur in other parts of the body. The most serious complication of a DVT is that the clot in a deep vein can break off and travel through the bloodstream. The loose clot is called an embolus. When the clot travels to the lungs and blocks blood flow, the condition is called pulmonary embolism (PE). PE is a very serious condition. It can damage the lungs and other organs in the body and cause death. The medical treatment is heparin, which stops blood clots from forming. This type of medicine is called an anticoagulant (also known as a blood thinner). If heparin is given continuously through a vein (IV), you must stay in the hospital and also have lots of complications. The medicine acts by reducing blood clotting and is a naturally effective blood thinner.